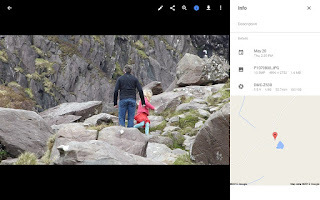 After my Geotagging IV post I realized that I didn't cover how to make the Google maps I included. 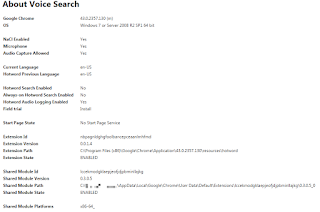 Set GPSLogger to "Log to KML" and to create a new file "Every time I start". 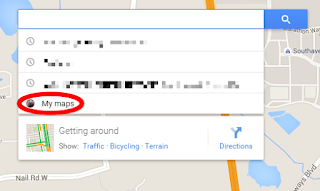 Also set location providers to "GPS". 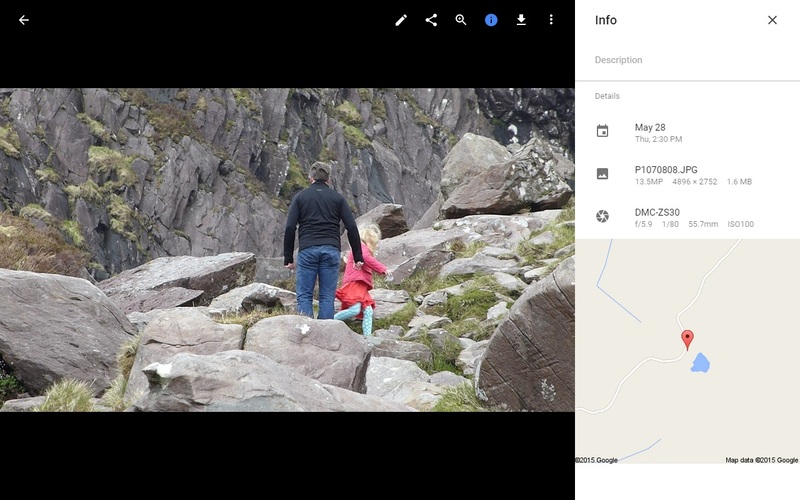 After recording a track use GPSLogger's integrated support for Dropbox to upload the KML files. 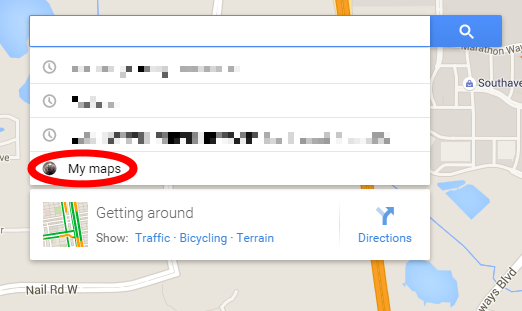 While logged into Google, go to https://maps.google.com and click on "My maps." Click on "Untitled map" to name the map. Click on "Base map" to specify the background map. Then click on "Import" to import your KML. Drag your KML files (from Dropbox) here. You can change the line color and width by clicking on the paint bucket. I volunteered for Motorola's Test Drive of Lollipop 5.0.2 on my 2013 Moto X. Let's just say it didn't go well. After I got the replacement device I got the itch for something new. I'd bought a couple of OnePlus Ones before and sold or traded them off. In early June, OnePlus started having "flash" sales of the One. I bought a 64GB SandStone Black for $299. My OnePlus One came with CyanogenMod 11S. OnePlus has had a squabble with Cyanogen and subsequently built their own Android ROM called Oxygen. OnePlus has Lollipop variants of both of these but mine shipped with KitKat 4.4.4. They're promising 5.1.1 "soon." I haven't been in a hurry to flash Lollipop on the OnePlus One. The OnePlus One goes against my bias toward modest, even small, phones. I'm still struggling with the One's size. The things that sweeten the deal are the gorgeous screen and the long lasting battery. I never had the Moto X battery completely go dead but I found myself "managing" the battery by just not using the phone. I didn't think that was what you were supposed to do with a phone. The OnePlus One's battery life isn't "magical" but I don't not use it for fear of exhausting the battery. At the end of the day I often find that I have more than 50% battery capacity left. You can watch my battery usage here. The OnePlus One came with a pair of SIM trays. One for a micro-SIM and one for a nano-SIM so I was able to just slip the nano-SIM out of my Moto X and into the OnePlus One. I did this before I did the initial power up and the LTE has worked perfectly on AT&T. Camera sensor size 1/2.6" 1/3.06"
As with the Moto X I got a Seidio Spring-Clip Holster (HLSSGT3AS). 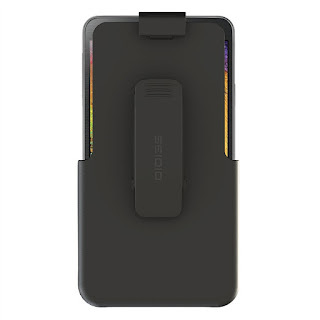 This holster is for a Samsung Galaxy Note 3 but it fits the OnePlus One fine. My OnePlus One came with a non-standard build XNF9XBS28K of KitKat. 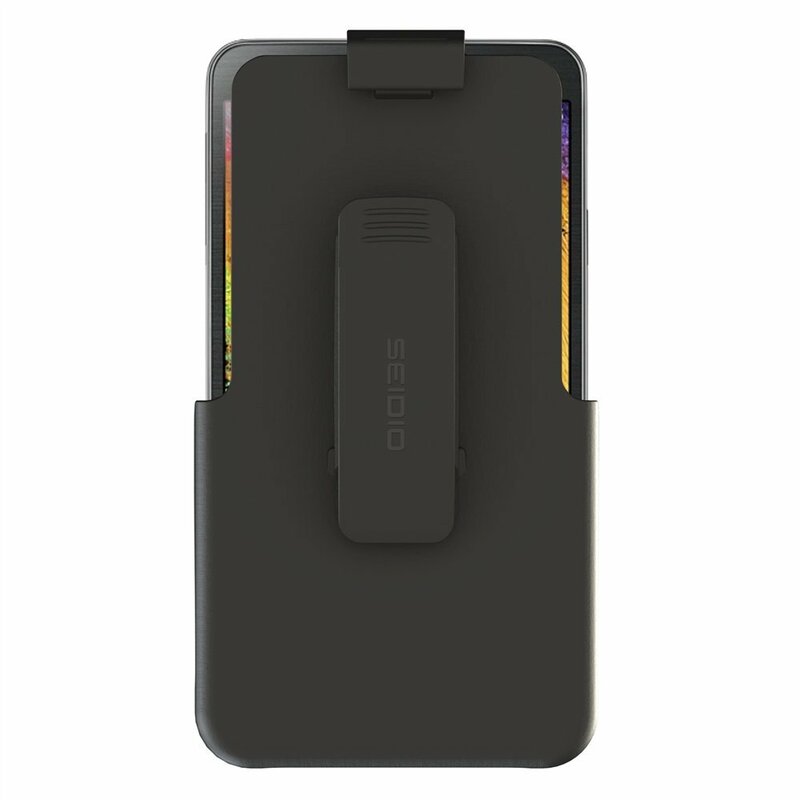 This is apparently a OnePlus internal build that is not intended to reach customers. Unfortunately many of the phones in the flash sales were shipped with this build. The downside is that this build doesn't receive Over The Air (OTA) updates so it won't get Lollipop. The upside is that it is really solid. I followed the instructions here and flashed Cyanogen OS 12 (5.0.2) and it's as wonderful as I expected. Oh, and I've installed the OTA Lollipop 5.1 on my Moto X. Which one am I using? Google seems to be killing Google Plus with 1,000 cuts. Latest is moving photos out to it's own app. I don't have the time or patience to address the "free" photo storage of Google Photos. Suffice it to say it's not "free." Anyway on to a subject dearer to my heart, viewing. 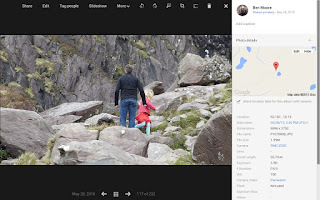 I previously looked at Google Plus Photos and compared them to Picasaweb. All of my findings/comments from there still stand. You'd hope that Google had noted those issues and addressed them in Google Photos. Just to recap here's the presentation of a photo in Picasaweb. Aaarg! Still no way to see all the exif data. No way to zoom the map. No way to change the base map, i.e. to satellite. Oh, do you want to change the sequence of the photos in an Album (or is it Collection?) 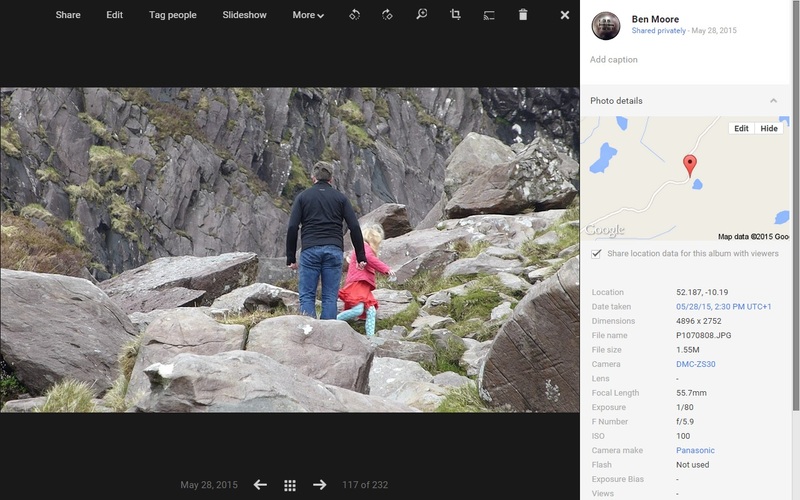 in Google Photos? Sorry. You have to go back to Google Plus or Picasaweb to do that. 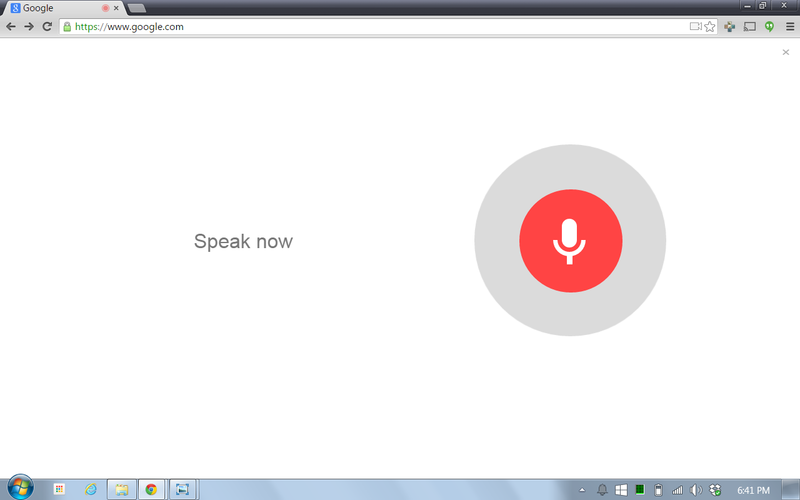 And Google Plus will nag you when you do. 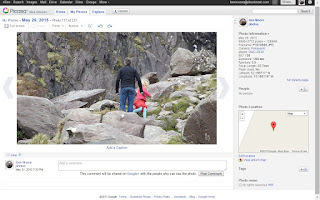 It seems only a matter of time until Google kills Google Plus Photos. What I do like is the sharing of Google Photos. You no longer get tangled up with needing Google Plus profiles. After I wrote this Google did another flip-flop restoring function previously removed from Picasaweb. This comment is exactly my feeling. 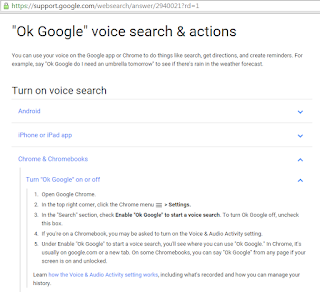 A while back, Google added support for "Ok Google" to Chrome. This article on CNET discusses it. 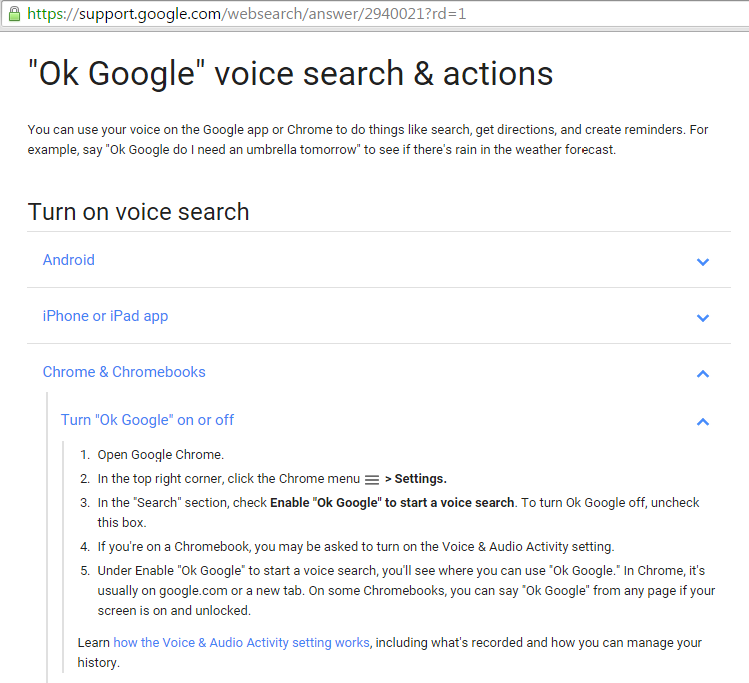 All the links I could find on how to manage this feature are out of date, even Google's support article. 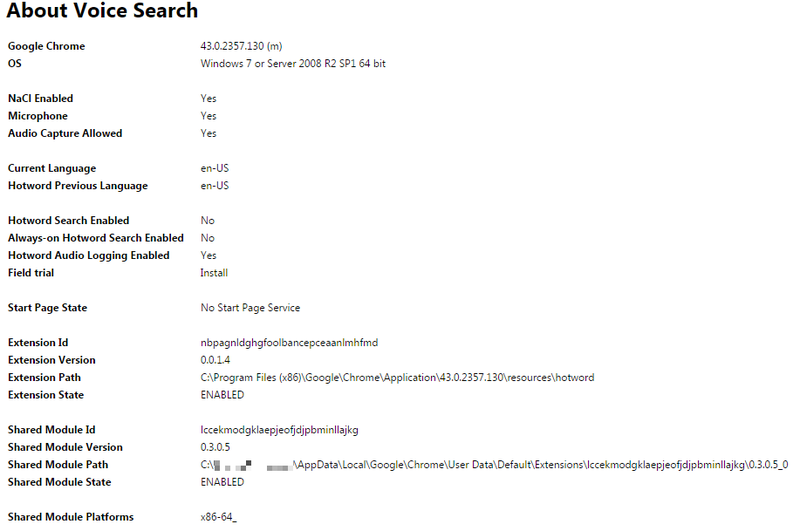 Chrome actually doesn't work that way for me on Version 43.0.2357.130 m (64-bit). Notice the red dot on the tab. It's listening. This post isn't about how to manage Google's voice search. 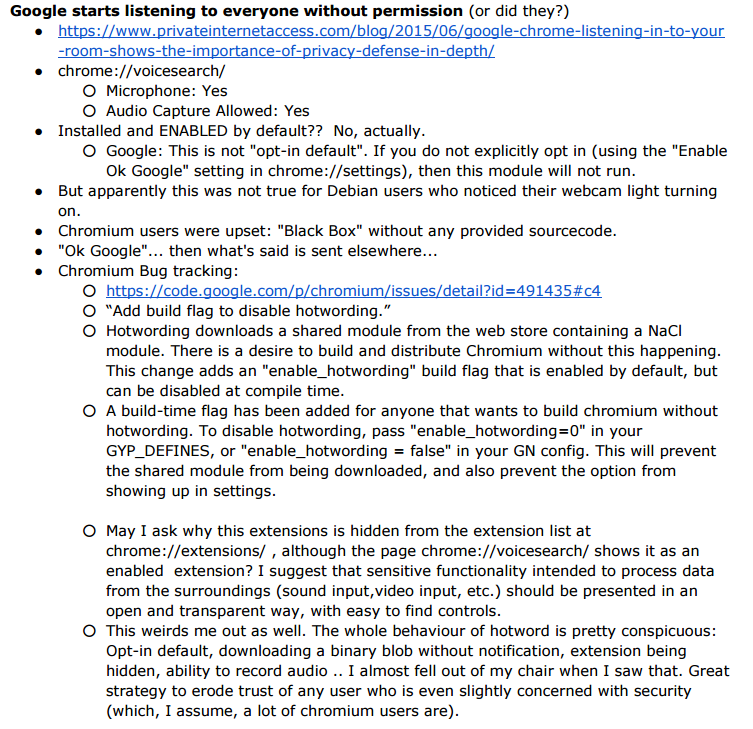 It's about how Google snuck the bits into the open source Chromium project. 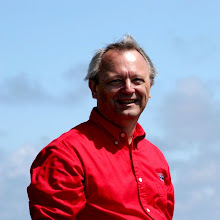 Steve Gibson's Security Now is one of my regular podcasts. 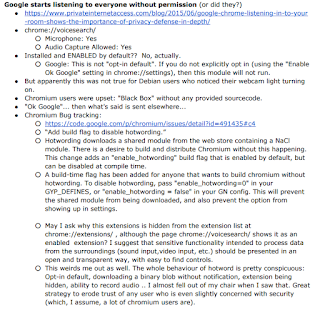 A recent episode covered the concern over Google inserting a binary "blob" into Chromium. 9TO5Google had a good article on the concern. What's happened to "Don't be evil?"